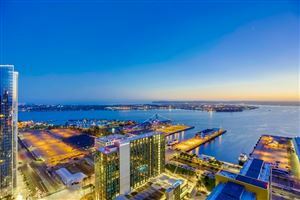 Located in San Diego’s Columbia District, soon to be called the Waterfront, on Pacific Highway between Ash and Broadway, The Grandeconsists of two, almost identical luxury high-rise towers. BOSA Development partnered with Perkins & Company Architecture and Urban Design Inc to bring San Diego these unique aqua-azul glass towers. The Grande Condos at Santa Fe is the Columbia District’s premier luxury condominium complex. The architect utilized an innovative triangular shape, orienting each home with dramatic glass corner views of the city and San Diego Bay. The Grande condo towers consists of 39 stories and 221 residences and feature their own separate HOA and amenities. The Grande floor plans are larger than many of the other downtown buildings and range from 899-1944 sq/ft. Step out of The Grande’s front lobby and you are a short walk away from great dining, entertainment and recreation. Choose an evening out and walk right over to Ruth Chris Steak House on Harbor Drive for a fabulous meal, or visit San Diego’s newest music venue, Music Box, for great food, ambiance and music. For an afternoon enjoying San Diego’s amazing weather, take a stroll across Pacific Highway and visit The Star of India and the beautiful San Diego Bay. The Grande’s spectacular location makes any choice convenient. Owners of The Grande Condos love their residences and their amazing views. Want to see the most recent condos sold at The Grande? Concierge service daily from 7 a.m. to 11:00 p.m.
Community party room and lounge complete with full kitchen, billiards, and large television. Visitors' Suite to accommodate your guests and family.